Debt is a modern day fact of life, and the cold hard truth is that most of us, unless lucky enough to be very rich, have some form of debt or another. Whether it’s just your mortgage, or whether your own personal debt extends to credit cards, loans and more, is a personal thing. But it is possible to handle debt positively, without going under – debt doesn’t have to be a dirty word! Credit cards can be one of the most insidious forms of debt, simply because they are so easy to use, most people have and use them without batting an eyelid and they are welcome in most places, including the Internet where it’s easier than ever to pay for things at the click of a mouse. 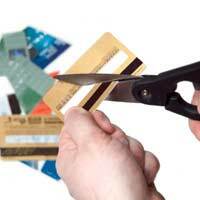 The best advice if you are a regular credit card user is to pay your balance off every month, and look for a card with cash back, and no annual fee. This can be easier to say than it is to do, though! If you’re not disciplined enough to pay your outstanding balance every month, make sure you have the lowest interest rate you can. The deals on 0% interest for credit cards are few and far between at the moment but if you sign up to websites for example, moneysavingexpert, you can get notified of any new ones and apply for them if your own rate is a little too high. Don’t do this unless you know you have a good credit rating though – the companies aren’t as free and easy with their low rates as they were. The bonus with loan repayments – for personal loans – is that you always know how much you have to pay back every month. Having said that, you can get swamped with a personal loan, car loan, credit agreement for a widescreen TV....the list goes on. Don’t be tempted to consolidate the loan unless there is no way out, and certainly don’t be taken in by alluring adverts that promise to reduce your debts by securing them on your home ‘for a low monthly payment.’ Yes, you will be paying less per month, but the amount of interest you’ll pay over the length of the loan is staggering. If you really can’t afford to keep up your loan repayments, contact the finance company and explain your predicament. Most companies have procedures in place and help lines to contact if you are having difficulties, and would prefer you to make some payment than bury your head in the sand and pay them nothing at all. You might be able to freeze the interest, reschedule the loan, or take a payment break. It’s worth a try! One positive thing about the economic climate is that the interest rate on mortgages seems to be coming down. This is all great news if you are employed of course, but if you have lost your job, or are struggling to make ends meet, paying the mortgage can feel like an insurmountable problem. The good news is that mortgage companies are being more supportive to people in financial difficulty in these uncertain economic times, and you may be surprised to find that they are more sympathetic to people who are struggling than they would have been a few years ago. The key is to contact the mortgage provider as soon as you start finding things hard – don’t wait until the situation is dire. See whether you can negotiate a few months mortgage break, while you try and sort out the job or finances. If you keep them informed and up to date about your situation, they are more likely to be able to help you and not rush into repossession proceedings and warning letters. The best place to go if the debts start to get on top of you is your local Citizens Advice Bureau. You can make an appointment to see an experienced debt counsellor, who will get you to write down all of your income, outgoings and credit details, and can draw up a repayment schedule for you. They will contact the people you owe money to, and try and get them to agree to reduced payments until you’re back on your feet. They can also advise you about Individual Voluntary Arrangements and Insolvency procedures if there really is no way out.